After reviewing this new Hungerford Properties development, we feel that the new Burnaby ALTITUDE Condos are some of the most premium suites that will be built in 2012. The new Burnaby ALTITUDE Condo project will consist of 2 high-rise towers offering 1, 2 and 3 bedroom UniverCity homes from the mid $200k range. We are excited to introduce to you the new ALTITUDE Burnaby Mountain condos that are superbly designed and finished for a reasonable and very attractive price. Brought to you by the Hungerford Group (or Hungerford Properties), the preconstruction Burnaby ALTITUDE Condos will represent the highest rising condominium residential towers in all of Greater Vancouver. With that in mind, residents and homeowners on most of the floors here at the new ALTITUDE Burnaby Mountain condos will enjoy fabulous vies of the North Shore mountains, downtown Vancouver skyline as well as the beautiful Indian Arm. 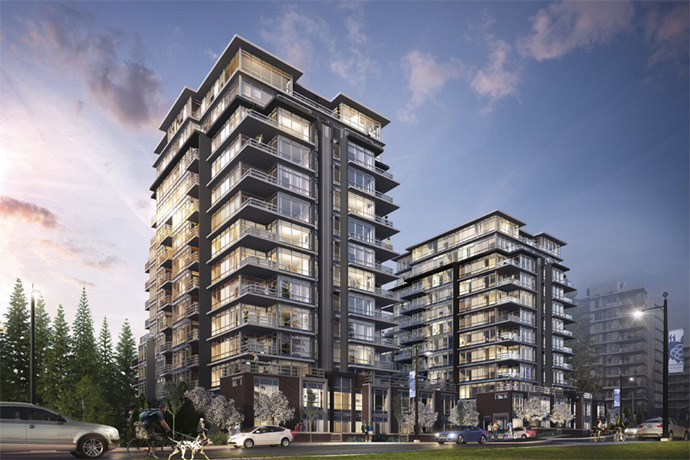 Situated in the award winning master planned and eco-friendly UniverCity SFU Burnaby real estate community, the new Burnaby ALTITUDE UniverCity condos for sale will be situated on one of the final parcels of land in this neighbourhood. Residents at Metro Vancouver’s new peak here at the UniverCity SFU Burnaby ALTITUDE Condos will not only enjoy the mountain top locale, but home owners will also be jut minutes away from almost fifteen hundred square feet of protected green spaces and natural park land, offering you lots to do outside including golfing, biking, hiking and walking trails. Next to the preconstruction Burnaby ALTITUDE UniverCity SFU condos for sale is one of the top rated schools in all of Canada: Simon Fraser University which has repeatedly won numerous awards in addition to McLean’s magazine award for Comprehensive University 9x running. The features and lifestyle choices here at the new Burnaby Mountain ALTITUDE Condos at UniverCity SFU are fit for many different ages and lifestyles, from professional singles and couples to families, students, professors and even investors. As a long term investment, the new SFU UniverCity Burnaby ALTITUDE Condos represents great value. For VIP Preview information and the latest details please visit www.hungerfordproperties.com to learn more about the Hungerford ALTITUDE Burnaby SFU condos for sale that will be launching Spring 2012. Best of all, the preconstruction Burnaby ALTITUDE Condos at UniverCity SFU start from just the mid $200,000s and are eligible for the HST Rebate and new homebuyers rebate that was just announced by the BC Government in February 2012. 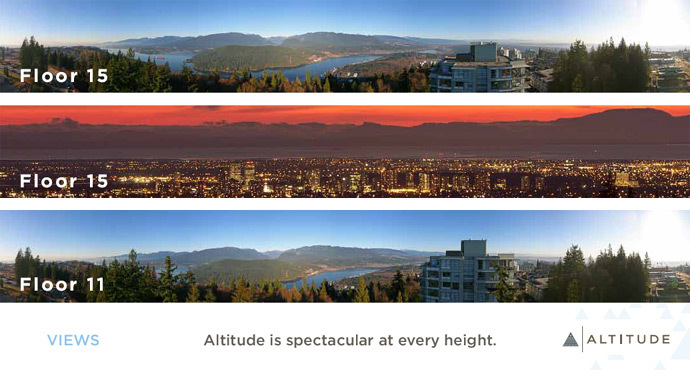 If you’re looking for great Burnaby real estate value, Altitude Condos have it. If you are looking for accessibility, the Burnaby Altitude condos have that too. And if you are looking for unobstructed views, you get it at Altitude by Hungerford Properties. ALTITUDE Burnaby condos fors ale offer a peak lifestylein the finest tower residences in all of the Burnaby real estate market, not just on Burnaby Mountain. Priced from just the mid $200,000 range, the presale Burnaby Altitude Condos offer both premium interior finishes as well as detailed craftsmanship throughout at a great price point. Connecting with your community and city is important. Walkable, sustainable and easily accessibly via the SkyTrain and bus routes, UniverCity at Simon Fraser on Burnaby Mountain will have everything you need. The UniverCity SFU Burnaby Altitude condos are convenient and well connected in every direction whether it be Downtown, Metrotown, Coquitlam Centre, Richmond, shopping, services, daycare, schools, services and even both the Evergreen SkyTrain Line and Millennium SkyTrain Line. Almost one in four new city dwellers choose Burnaby and this is why! The UniverCity Burnaby Altitude condo towers rise higher than any other Metro Vancouver development. This means that residents at the Burnaby Altitude at UniverCity condos will get views of the North Shore, Burrard Inlet and downtown Vancouver from their own homes. Every floor has a different angle or exposure, but what is known is that the majority of suites here at the presale Burnaby Altitude at UniverCity SFU condos have incredible views. As well, the ALTITUDE Burnaby Mountain condos are located in a 65 hectare master planned community called UniverCity SFU where you will be living in a multi award winning, walkable urban village that just recently won the Canadian Institute of Planners award for Planning Excellence in the category of Neighbourhood Planning, right here at UniverCity SFU Burnaby Mountain. The presale Burnaby Altitude UniverCity SFU condos offer a peak lifestyle at a fraction of the price and is brought to you by award winning Hungerford Group. On site, the Altitude Burnaby Mountain condos will also provide over 8000 square feet of amenities that include a professionally landscaped courtyard with gardens, cardio gym, owners lounge with catering kitchen, lounge seats, large family style dining table and an outdoor barbeque area. Investing in Burnaby real estate can get complicated some times with so many offerings between old and new property. However, here at Altitude Burnaby Mountain condos, the Hungerford Group is designing and developing the premier project in all of the city, high atop Burnaby Mountain in the master planned and award winning UniverCity SFU neighbourhood. The superbly design and finished presale Burnaby Altitude Condos at UniverCity will deliver far more value than their price would suggest. Features and the amenities are designed to appeal to a variety of lifestyles and ages in the UniverCity SFU Burnaby real estate community. And with Simon Fraser Univercity’s population set to explode through expansion, the affordable Burnaby condos at Altitude UniverCity SFU is very well situated to leverage year round demand for rental housing. In addition, the affordable Burnaby condos at Altitude Living represents one of the final project sites available in the UniverCity district. It is the highest tower offering premium views and is just 1 block away from the major bus loop that connects to 2 SkyTrain lines. 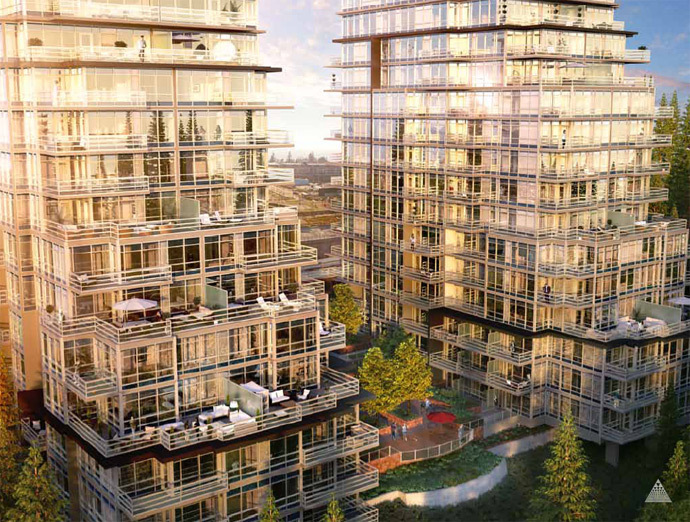 Please note that presales start at the Burnaby Altitude Condos in March 2012. Plesae register on our web site for the best selection and pricing. The 1 bedroom suites at Altitude UniverCity condos starts from 505 square feet and $259,900. The 2 bedroom draft layouts at the Burnaby Mountain Hungerford development starts from 755 sqft and $364,900. The spacious family sized 3 bedroom Altitude Condos in Burnaby UniverCity start from 1,040 sqft and $481,900. All homes are subject to the discounted HST transitional rebates as well as the first time homebuyer rates in BC. The premium building by Hungerford Properties features an enviable locale in the heart of the UniverCity SFU campus where you will find the highest elevated condominium residence in all of Metro Vancouver. The UniverCity SFU Altitude Burnaby condo residences will be designed by award winning and trusted GBL Architects. In addition to having spectacular terraced building architecture, the new preconstruction Burnaby Altitude Condos at SFU UniverCity neighborhood will also feature plenty of outdoor entertainment space as per floor plans to maximize not only your living space, but also your incredible panoramic and unobstructed views from the new peak of Metro Vancouver. The Hungerford Altitude Burnaby Mountain condos for sale will feature interior finishes that are uncommon for the price point that starts from the mid $200’s as well as lighting throughout the professionally landscaped grounds that are very beautiful and low maintenance. The UniverCity SFU Altitude Burnaby condos for sale will also include a rain garden system to ensure longevity as well as high quality stone pavers and courtyard furniture for all to enjoy. The double height Altitude Burnaby Mountain condo lobby will have custom designed lighting, comfortable entry way seating as well as custom millwork throughout. The premium local materials used at the UniverCity SFU Burnaby Altitude condos for sale will include smooth brick finishing and concrete casings in addition to custom designed railings, blue accent spandrel and sophisticated energy efficient glass window systems for energy efficiency. Also, the Burnaby Mountain Altitude condos are just 1 block away from the SFU bus loop that connects to the SkyTrain lines and there is also a proposed gondola from the SkyTrain to the bus loop in the works right now at City Council. In addition, for families with younger children, the preconstruction Burnaby Altitude condos at SFU UniverCity are just a few minutes away from the new University Highlands Elementary School in addition to the new world class UniverCity Childcare. Nearby the new UniverCity SFU Condos on Burnaby Mountain are all the shops and services right at your doorstep too. The Interiors of the Affordable Burnaby Altitude Condos at SFU will include professional design palettes by i3 Design Group in addition to 3 different schemes to choose from as a presale homebuyer. Also, the new Altitude Condos at Burnaby Mountain will include 9 foot ceilings in most floor plans and levels as well as recessed pot lights, smooth finished ceilings and hydronic heating throughout the community which is very energy efficient and will save you on heating costs. The UniverCity SFU Burnaby Altitude condos by Hungerford Properties will also include wide plank oak hardwood floors in most living areas including the kitchen as well as Green Label environmentally friendly carpeting in the bedrooms. All of the windows have roller shades and coverings for extra privacy and the new Altitude Burnaby Mountain condos will have full sized Energy Star rated washer and a full size dyer inside a laundry closet. The floor plans afford large open outdoor spaces with gas BBQ hook ups and water bibs in addition to many other incredible features. The preconstruction Burnaby Altitude SFU UniverCity condos for sale will also feature incredible Penthouse Suites that have 10 foot ceilings, Miele appliances (upgraded) and oversized private roof decks. The bathrooms and ensuites are beautifully designed, functional and well finished with large format porcelain tile work, deep designer tubs by Acri-Tec and relaxing oversized showers with custom tiled flooring and frameless glass doors as per plan in ensuites. The bathrooms at the SFU Burnaby Mountain condos at Altitude UniverCity will also feature eco friendly tubs by Kohler and shower system with chrome accessories, Grohe low flow faucets, Kohler dual flush water conserving toilets and efficient integrated double sinks in the ensuite baths. They are also finished with sustainable Greenlam wood vanities, drawers for extra storage and recessed pot lights. The chef’s kitchen at the preconstruction Burnaby Altitude condos at UniverCity SFU Burnaby Mountain real estate development by the Hungerford Properties Group will feature a top high-end appliance set that includes GE Café appliances as well as a Fisher Paykel 33” Energy Star rated fridge with bottom mount freezer. The other kitchen features at the new Altitude Burnaby affordable condos for sale include an in sink garburator, Grohe low flow faucets with pull out spray, extra wide undermounted double bowl stainless steel sink and under cabinetry recessed LED lighting. Also available at the affordable Burnaby Altitude Condos at UniverCity include Greenlam wood veneer cabinets and premium quartz engineered stone counters. Sustainable living is what UniverCity SFU community is all about. Here a the Hungerford Altitude Burnaby Affordable Condos, home buyers will be pleased to note that the building construction and materials will adhere to the UniverCity’s award winning Green Building Strategy which is designed to be up to forty five per cent more efficient than a traditional building project. The UniverCity SFU Altitude Burnaby Affordable Condos will have hydronic water heating that is supplied by the District Energy System of UniverCity SFU and with low flow faucets, dual flush toilets and low VOC paints, every detail has been made possible to reduce the environmental impact of this great project. Also, the Greenguard Certified Greenlam cabinetry is very eco friendly as are the kitchen recycling centres with 3 bins. Energy efficient lighting and Energy Star appliances are also presented at the new Altitude Burnaby Affordable Condos. Some of the new Burnaby Altitude Amenities include over 8000 square feet of indoor and outdoor amenity spaces with a state of the art fitness centre and owner’s lounge that includes a kitchen, dining area, wi-fi internet service, workstations, outdoor covered terrace deck with BBQ station and a lounge seating area. Also, all new Burnaby Altitude condo owners will have access to the UniverCity SFU community card that gives you membership to the 12,000 square foot multi level fitness gym, group fitness programs and the library, theatre and pool. There is also an expansive sustainable rain garden and children’s play ground that is designed by PWL Landscape Architect. And 10% of the parking spots at the new Altitude Burnaby Affordable Condos will be for hybrid or electric vehicle re-charging stations. There is secured residential and visitor parking on site as well as bike storage locker rooms. There is an enterphone on site and wireless key FOB access to all common spaces including the amenities. There is a full time live in resident caretaker and security systems pre wired in each home at the new Altitude Burnaby Affordable Condos. As well, homebuyers will receive the standard Traveler’s 2-5-10 Home Warranty Coverage for your peace of mind. VIP Early Selection is coming soon for the spectacular UniverCity Burnaby Altitude Condos featuring 1, 2 and 3 bedroom mountain top mid-rise homes. This boutique Burnaby Mountain real estate development is unique, compelling and eco-friendly and suites will start from only the mid $200,000’s. At 1300 feet above sea level, the towers at Altitude Burnaby Mountain condos will rise higher than any others in Metro Vancouver. Here, on one of the last, best view locations atop Burnaby Mountain UniverCity real estate district, the preconstruction Burnaby Altitude UniverCity condos for sale will enjoy a unique combination of panoramic views/vistas, high quality interior finishings and craftsmanship in addition to the intellectual stimulation of the Simon Fraser University locale, which was just rated as the top University in McLean’s magazine for the ninth year. 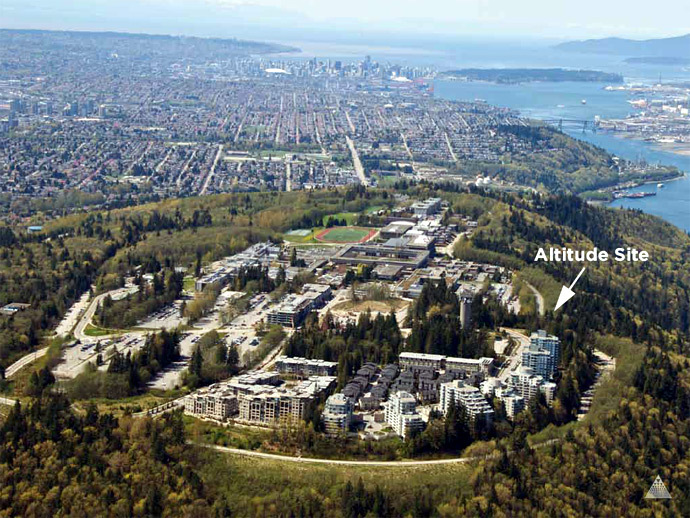 Presales at the new SFU Burnaby Altitude condos by the Hungerford Group developers will start in March 2012! Register now for your chance to own at the new SFU UniverCity Burnaby Altitude condos for sale. Burnaby Altitude floor plans to come. Stay Tuned!